Auli is the perfect place to escape the scorching heat of the cities in summer. About 3km from Auli, the trek to Gurson Bugyal at an elevation of 3,056 meters is a must for all the travel junkies. This trek is best done in spring-summer because that’s when the meadows turn a lush green colour, surrounded by white peaks like the magnificent Trishul and Nanda Devi on all sides. Keep an eye out for beautiful oak, rhododendron and pine trees on your hike there. Known to be one of the highest man-made lakes in the world, Auli Artificial Lake was created with the purpose of providing snow to the ski slopes in case of scanty rainfall. However, a summer evening here can turn out to be one of your most cherished memories. Imagine catching a sunset here, with some of the highest peaks in the background. Auli is India’s answer to Switzerland; since it is covered in snow all round the year. That makes Auli the perfect place to indulge in the sport of skiing. Whether you’re a seasoned skier or an amateur, Auli embraces everybody equally. Skiing is highly recommended here in summer; the stunning Himalayan Range in the backdrop taking the experience to the next level. 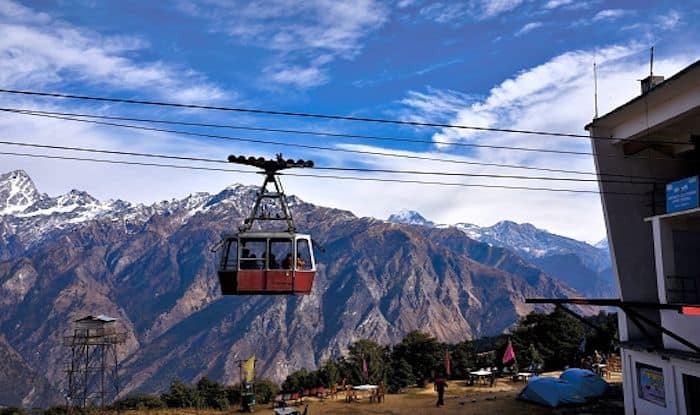 Running for four kilometres, the ropeway in Auli connects the base of Joshimath to Gurso Bugyal. It is known to be the longest and highest ropeway in the country. The ride takes you from an altitude of 1,110 meters to 3,000 meters, offering breath-taking panoramic views of the town, the lush green meadows and the snow-capped peaks. Camping in Auli in summers is a must; the skies are usually clear and allow an unhindered view of millions of twinkling stars. Being one of the highest points in India, the temperatures can drop to as low as -5 degree Celsius at night even in summer, therefore, remember to pack for a rather chilly experience.